Map acknowledgement. This last section is usually known in guidebooks as "The Northern Turks". Joss Lynam writing in MC characterises the hills as "Rounded, damp mountains with peat hags on their plateau tops, they are not as immediately inviting as the quartzite peaks nearby ..."
As is customary the section starts with a sharp climb, this time from Mám Tuirc (Maam Turk) up Maumturkmore. According to the method used for calculating steepness on my route card, the first leg has a gradient of around 30%, however the first fifty metres of ascent must be at nearer 60%, as can be seen in the photo of the V shaped pass shown in the last section. You scramble up a gap in a cliff essentially. Eventually you gain a ridge on which you can walk to the summit of Binn Bhán. On the organised walk there is generally a checkpoint here. As you continue on the ridge you will come to a trig point; it isn't the main top however it is en route to the next ridge, identified as Gleniska on the OS and 362 on MC, shown here. Tip: take a shortcut and an angled descent towards point A. (Just to the left of "Cúlog" on the map.) This avoids a really sharp descent off pt 362, at the expense of some contouring. 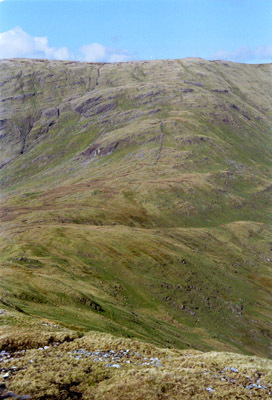 Point A on the map is the lowest part of the saddle between Glencraff and Gleann Glaise with a height of around 250m. People who have done the walk will know why it is labelled here as the Col of Despondency. It can require a supreme effort to climb this much at the end of a hard day. I have seen people literally pulling themselves up the fence that runs part of the way. Even were you to decide to quit the walk, the available options are distinctly uninviting. Probably the best way to finish would be to turn NW and head around the north side of the mountains to Leenane, however this would be 8 to 9 km. The final pull up, shown in the picture, is some 350m. After a boggy start the first piece has a wall beside it. You will reach a rocky outcrop. The ground flattens out for a bit after this outcrop and then you pull straight up over another steep part. Finally, you can see a grassy slope leading off to the left. and the final pull up towards pt 578. Take this, as the walking will be easier and will save you a little at the top. The summit which has a small cairn on it, is thoroughly unexciting, except that it marks the point from which you have to do no further climbing! It is identified as 578 on the OS (562 on MC) and is known locally as Meall Cheo. Before you leave, have a look at the view from the summit. Views to the north can be very impressive. NE View from just south of Gleniska. Photo: 1996. Map acknowledgement. From the summit walk northwards to the small lake. You will need to contour round the bump (556 on OS) around 700 m north of the summit. Stick to your bearing. Tip: Don't be confused by the any boggy ponds before the small lake (Lochán), which isn't visible due to the convex nature of the ridge until you are fairly near it. "Lochán" is quite substantial. Turn right at it to commence the very demanding descent towards the Leenane Inn. The hill here is known locally as Leacan. My route card indicates that the average gradient of this final slope is around 38% which is a severe test at the end of the day. It doesn't let up at all until the very end, at the Leenane Inn. Now isn't that convenient for a drink? Unfortunately if you are doing the organised walk (late April/ early May) it's generally shut, so you will have to walk down to Leenane for a pub. Photo April 2006 Revised descent. Currently the organisers of the "official" Maamturks walk encourage people to take a north westerly route down, where you turn left somewhere before Lochán into the valley of the Laghtyfahaghaun River there. You can then pick up the Western Way and head east for the finish in Leenane. This route is longer, slower, safer and easier on the knees. The view opposite is what you see on the way down with the slopes of Ben Gorm on the right and the mist covered east shoulder of Ben Lugmore (East top) central skyline. The original final descent. 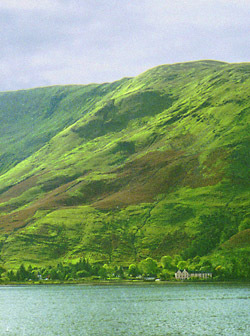 The path shown on the map would take you from the around the middle of the skyline slightly leftwards and down, under the prominent dark cliffy area and then diagonally to the lower right of the picture over some reddish bracken, finishing at Leenane Inn which is the pink building. The walk is always hard and in bad weather it can be a very serious challenge. Of over 300 who started in 1995 when the weather was bad, only about 80 finished. (Actually that compares well with the earliest years see reference to The Big Walks.) Still, by the time you've had a drink and a meal, you'll start forgetting the pain and start planning the next one. The main part of Leenane (or Leenaun or An Líonán) is around 800 m to the left of the Inn. There are two pubs and restaurants of various types. Leenane Inn and Killary Fjord. 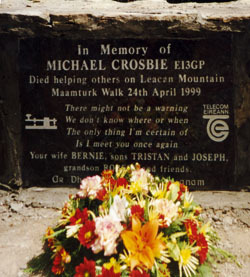 The Memorial to Michael Crosbie who died descending the last slope after assisting with radio support during the walk of 1999.